Gardening is beneficial to your well-being in many different ways. Unfortunately it can also be harmful to the environment if eco-friendly practices are not used. Growing your own fruit and vegetables, done in an eco-friendly way, will help the environment (and your own health) in many ways. It is the ultimate in local food and will help in the reduction of greenhouse gases. With so much agriculture and horticulture given over to industrial-scale monoculture home gardeners may be the saviours of biodiversity. As the abundant warnings on garden herbicides and insecticides attest these products contain nasty substances. Some of these not ony hit the target species but also poison birds and other wildlife and pollute water systems. It is also possible that, like many household cleaning chemicals, they are the result of a polluting manufacturing process. 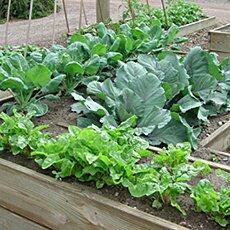 Just with farming (see Organic farming) weed and pest killers may be avoided with a little effort. Dig or pull them out by hand. Difficult weeds may need to be dug over with a cover of plastic or carpet to deny them light. The natural solution is the best. Birds will eat snails. Hedgehogs will eat slugs. Ladybirds and lacewings will eat aphids. Birds can be encouraged by certain planting (eg hedges) and bird boxes. (And by keeping you cats under check – put a bell around their neck!). The growing of certain plant species in proximity may repel pests.